In the previous issue, you got a glimpse of the upcoming HTML newsletter template creator, which allows list owners to design fully responsive HTML newsletters without HTML coding experience. Now let's examine another major emphasis of LISTSERV 17.0 – the new and improved list archives. The automatically maintained list archives have long been one of the most important features of LISTSERV. Many long-running discussion lists carry decades worth of knowledge in their searchable archives. Depending on how the list was configured when it was originally created, the archives are usually divided into weekly or monthly segments. While the archive search feature has always allowed subscribers to find topics of interest, the downside of the old weekly or monthly archives is that discussions and threads often continue over several weeks or into a new month, which causes an unnatural break when you're reading threads and need to click to navigate to another week or month. To remedy this, LISTSERV 17.0 introduces a new single index, which merges the individual weeks and months into a single comprehensive archive, dramatically improving its user-friendliness. All you have to do is to reindex your list after upgrading to LISTSERV 17.0, and you'll be able to immediately take advantage of the new possibilities that the single index provides. When you first enter the list archives after enabling the single index, the archives are rendered using "Classic View". This default mode will look familiar to long-time users of LISTSERV and looks much like an email inbox. You can sort the archives by date, sender or subject line just like before. The main difference is that the entire list archive is now used for your desired sorting method without the need to navigate across weeks and months. This is particularly useful if you're sorting your archives by subject line or sender because threads are now displayed in their entirety. The filter row allows you to instantly filter the messages in the table, making it easier to find topics or senders of interest. The "Next Page" button at the bottom of the screen allows you retrieve additional messages if needed. 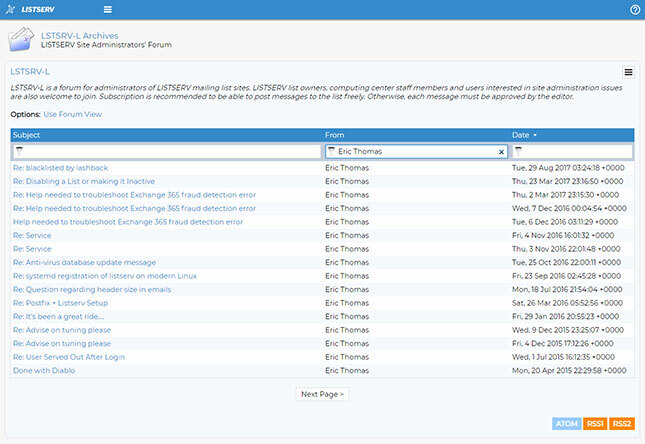 A second mode available under the single index is called "Forum View". To switch to this mode, simply click on "Use Forum View". If you're logged in to the web interface, your selection is saved as part of your personal preferences, so your preferred mode will be in effect the next time you log in. This mode turns the list archives into a format that resembles a message board. The most recent original thread is always displayed at the top, with all of the responses to that thread listed below in chronological order. 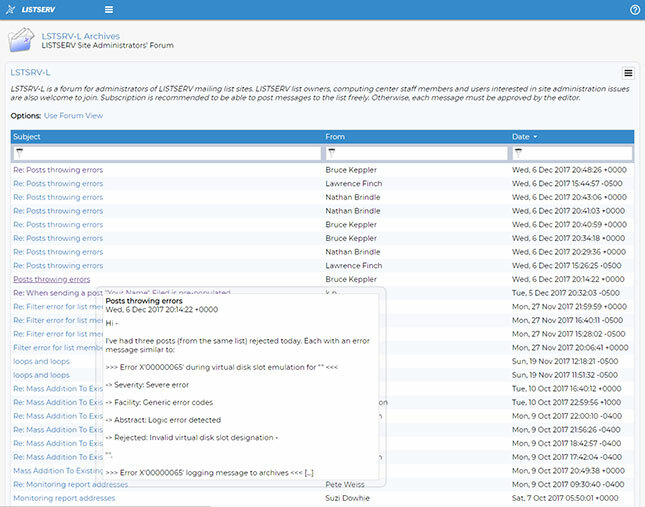 The automatically generated RSS abstracts associated with each message are displayed directly on screen. You can also see the number of replies to each thread. To view these responses, simply click on the appropriate link, which will immediately expand the thread and display all of the replies below. There is yet another mode available under the single index, which is called "Blog View". It's closely related to Forum View and works in exactly the same way except that it has a custom stylesheet, which allows list owners to make their lists look and feel like a blog. 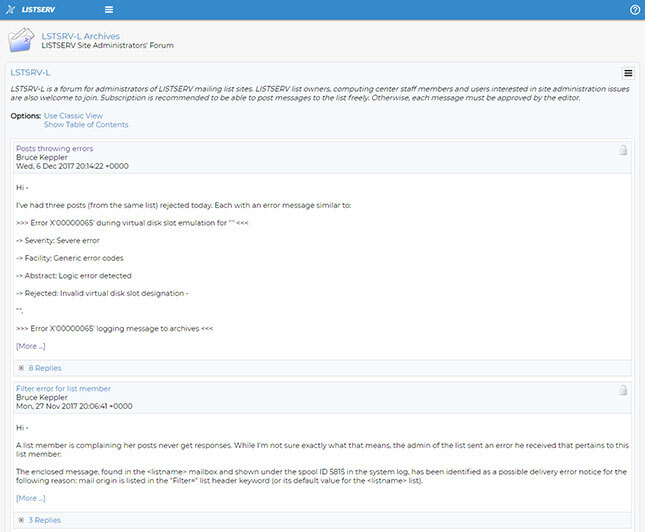 As with Forum View, the most recent original thread is always displayed first, followed by all of the responses (or comments) in chronological order. Because Blog View comes with a custom stylesheet, the list owner needs to enable this mode. This can be done with a single pull-down menu on the new list customization screen (which I'll cover in more detail in the next issue). 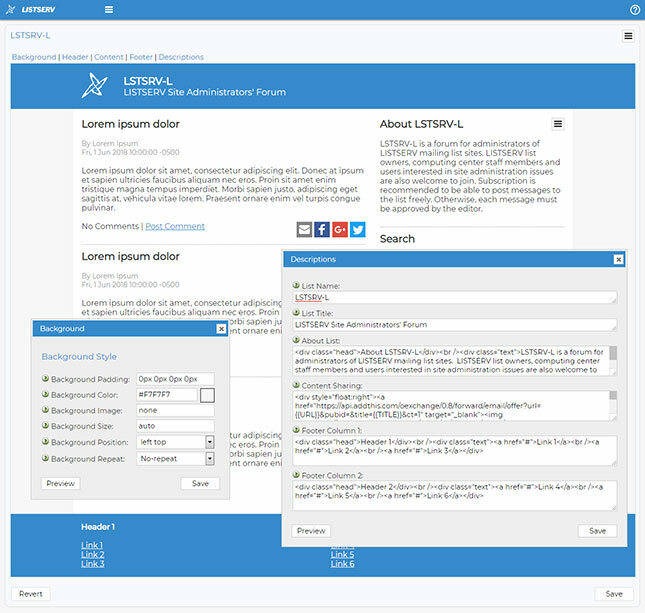 You then have the option to customize the special blog stylesheet using the same types of pulldown menus and input boxes used by the HTML newsletter creator. You can also incorporate social media plug-ins and content sharing icons into your list archives. After you're done with your customization, or if you just prefer to keep the default settings, the list archives will now be rendered using "Blog View", which has the feel of a freestanding blog. 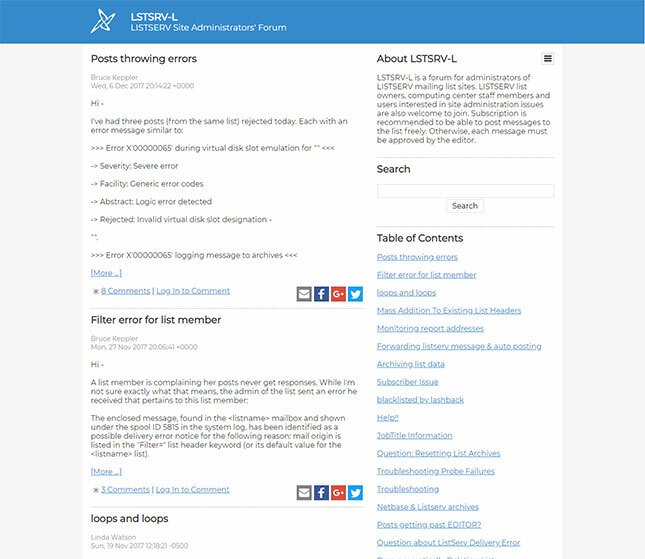 Interested in testing the new LISTSERV list archives or the responsive HTML templates mentioned in the previous issue? 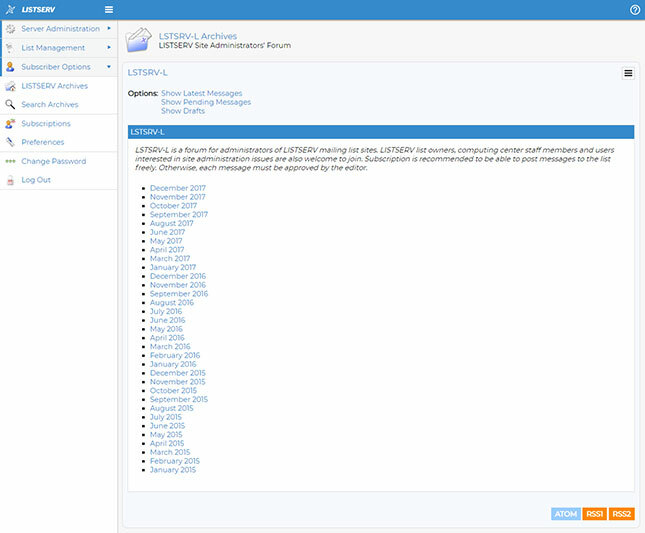 Beta testing of LISTSERV 17.0 starts soon, and we need organizations to participate. 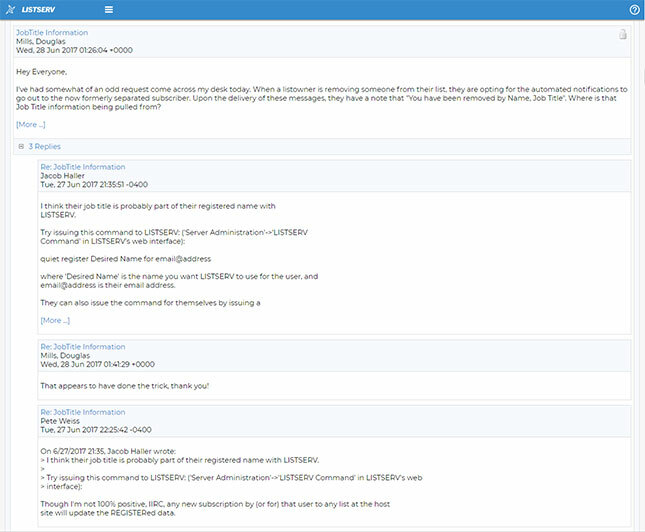 If you're interested in being a beta tester or want to learn more, contact us at: beta@lsoft.com.